You’ll never step into the same library twice at Villanova University. That’s because the Library constantly adds new titles to its collection to keep up with new research and new interests. But how does an ordinary book actually become a Library Book? The Library receives book requests in many formats and from many sources. Requests can come from a librarian, a faculty member, staff or a student. They are routed to the Resource Management Center (RMC) via the online request form or regular email. 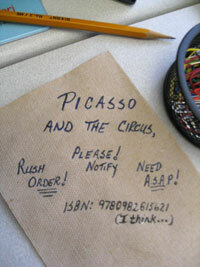 Sometimes we even receive requests on Post-it notes, post cards, scrap paper or napkins. Most requests must first be routed to the designated subject librarian for purchase approval. Once approved, the order is forwarded to the Acquisitions group and is ordered, either from our book vendor, Yankee Book Peddler, or from another source like Amazon.com. When the new book arrives, it goes directly to be cataloged. 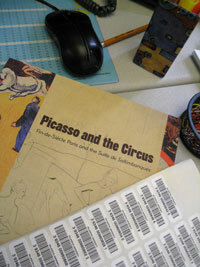 This process includes assigning the book a unique barcode and then establishing its record in our online catalog. Some books can be cataloged in just minutes; others take much longer. 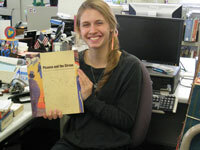 Christine Bochanski, RMC student aide, processes the Picasso book. Once it’s cataloged, RMC student employees insert a security device into the book, stamp the library name on it in several locations, and apply a call-number label to its spine. 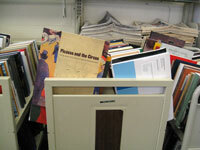 RMC students process hundreds of books every week, and their attention to detail is crucial. The book has now become a Library Book. Finally, the Library Book is put on a cart with other new books and taken to the sorting room, ultimately to be proudly shelved in its proper location. The patron locates this new Library Book through the library catalog and checks it out at the Circulation desk! This process explains how a print book becomes a Library Book. The Library also purchases e-books, but that’s a different story! I’m looking forward to the sequel on e-books! Where i can download the e-book version of this book ? How are the principles of intellectual freedom and intellectual property rights balanced with the need to avoid censorship? How does the public library system ensure information is equally available to all members of the “public” rather than favoring the elite with the financial means to obtain sooner? Thank you for considering my questions. Could you please answer what has to occur for a book that is, for example, on the current best seller list to become available at a local library? The title of this article is “How does a book become a library book?” yet that question is not addressed. I would also be interesting in knowing how the principles of intellectual freedom and intellectual property rights are balanced with the need to avoid censorship? In other words, how does the public library system ensure information is equally available to all members of the “public” rather than favoring the elite with the financial means to obtain sooner? Thank you for considering my questions.